43. Kosofsky, L.J; and El-Baz, Farouk. The five Lunar Orbiter missions flown in 1966-67 were in their own way as amazing and successful as the later Apollo missions. Each spacecraft took actual photographs on a continuous reel of film; the film was then developed on board, and scanned with a special photoelectric system. These signals were transmitted to earth, where the photographs were reconstructed. 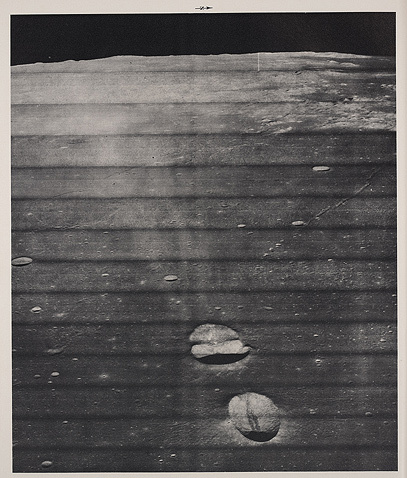 The Orbiter missions were designed to photograph all possible Apollo landing sites, but this goal was accomplished by the third mission, so Orbiter IV was devoted to photographing the entire lunar near side, thus making possible a photographic lunar atlas of unprecedented quality, while Orbiter V photographed selected features of special interest. There were many memorable Orbiter photographs; Orbiter I recorded a beautiful panorama that showed the crescent earth in the distance, and Orbiter II took a stunning oblique view of the crater Copernicus. Less familiar is this photograph of remarkable beauty taken by Orbiter V, looking westward across Mare Fecunditatis (Sea of Fertility). It captures the twin craters Messier and Messier A (the latter a pancake of one crater on another) which have intrigued lunar observers for centuries. The horizontal lines represent the "framelets" produced by the scanning system.